Membership — We’ve grown quite a bit in recent years. The SJAA membership is now about 350, so you can imagine the gymnastics needed to juggle that many on a spreadsheet. Our primary options are 1) Simple Machines Forum + Paypal and 2) Tendenci. The board of directors has already been using SMF to conduct club business so it’s a natural fit. We just started looking at an open source membership management package called Tendenci. 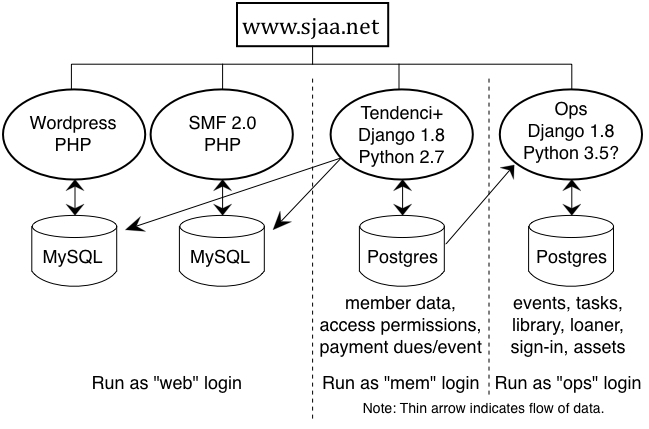 The plan is to eventually allow all members access to an SJAA specific forum, all under www.sjaa.net. (perhaps sometime in the not too distant future) post to Twitter and Facebook. We’re also looking to automate management of the various tasks associated with each of our events. Libary/equipment loaner programs — Most of the work here is bookkeeping, tracking the various assets. Automation will streamline the process and allows online access to the information. Sign-in — In the past year we started using paper sign-in sheets for our events. This allows us to provide documentation to the city of San Jose which grants us free access to the facilities we enjoy at Houge Park. A digital sign-in system will allow us to take a detailed look at who’s coming to our events and help us to better understand how to reach out to our members as well as the general public. Last Saturday night was the annual membership meeting of the SJAA. There was a potluck, awards, and the annual election for about half the seats of the board of directors. Bill O’Neil, Glenn Newell, Rob Jaworski and Dave Ittner were all up for reelection, and we are happy to report all nominees, all of which are incumbents, were reelected to another two year term by the membership. Each candidate received 24 votes in favor and zero against. Congratulations to all the candidates! The SJAA membership and the broader amateur astronomy community appreciate your service to this important educational institution serving the south bay and beyond!